Sometimes bad things have to happen before good things can. I loved you long before you loved me. It’s the only thing I have you beat at, and I’ll bring it up every chance I get. I couldn’t stand here, hanging on, when the very thing I held disappeared more with each passing day. Don’t blame me. Tell your mom to move closer. Tell her there’s this new club called civilization and you guys should join. 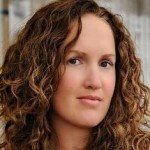 Becca Fitzpatrick is an American novelist, best known for having written the New York Times bestseller, Hush, Hush. Raised in North Platte, Nebraska, she graduated in April 2001 from Brigham Young University with a degree in Community Health, and went to work as a secretary, teacher, and accountant at an alternative high school in Provo. In February 2003, her husband enrolled her in a writing class for her 24th birthday. It was in that class that Fitzpatrick started writing Hush, Hush and her work was admired."